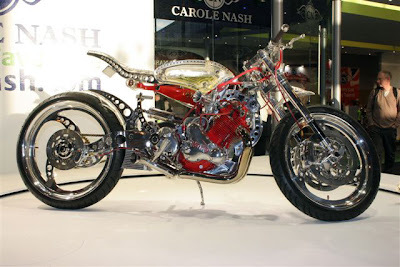 Carole Nash Bike Show, The 2-Stroke Lives! The Carole Nash bike show opened at Britain's N.E.C last week, and for the first time in the shows history a dirt bike and off road section was added. Interestingly, just about every off road stand had a 2-stroke bike somewhere on the carpet. Suzuki even went beyond that by displaying an immaculate RM 400 on the roof of their stand! Of course there were plenty of 4-stroke bikes at the show as well, but the message was loud and clear that the 2-stroke hasn't died yet. The claims that 2-stroke engines can't be advanced any further has been proven wrong by the introduction of high tech 2-stroke snowmobile engines with advances such as direct fuel injection. The power to weight ratio of 2-strokes is still superior to the 4-stroke, but there are some shortcomings to the design that haven't been improved because of the lack of R&D. 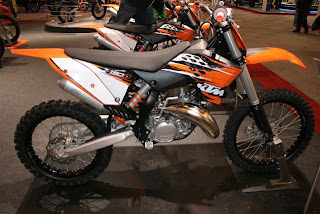 KTM's new 150 motocross bike was getting plenty of attention at the show, as were many of the smaller Yamaha bikes. KTM has been one of the front runners in going forward with the production and R&D of the 2-stroke bikes and offer a wide range of options. Husqvarna sported this sweet little CR50 as well. These are good signs that 2-stroke innovation may be right around the corner, and that it's still the best option for many of us. 2-stroke technology may still give the 4-strokes a run for their money, it's definitely out there waiting for someone to tap into it.